Even when planning a pregnancy, many women are faced with wondering exactly what to do after a positive pregnancy test. The emotions of this life changing situation can be overwhelming when you first see that pink plus sign, but here are some practical and important steps to take when you discover you are pregnant. Conduct a blood pregnancy test, which is more accurate than the urine home pregnancy tests, to confirm that you are pregnant. The blood test can detect the pregnancy hormone, HCG, as early as eight days after ovulation. Calculate how far pregnant you are based on your last normal menstrual and your due date from that or order a pregnancy dating if your dates are uncertain. You can also use an online calculator to figure out your due date. Schedule you for a follow visit to review your complete medical history, perform a general and a pelvic exam, discuss any current health issues you have that might affect your pregnancy, and initiate necessary prenatal labs. Enroll you into a formal schedule of prenatal care office visits, which become more frequent during the third trimester. If you do not have health insurance, you can visit a clinic such as Birthright or talk to your local health department about free pregnancy testing and government-funded health care programs. If you smoke or use street drugs, stop or get help to quit immediately. 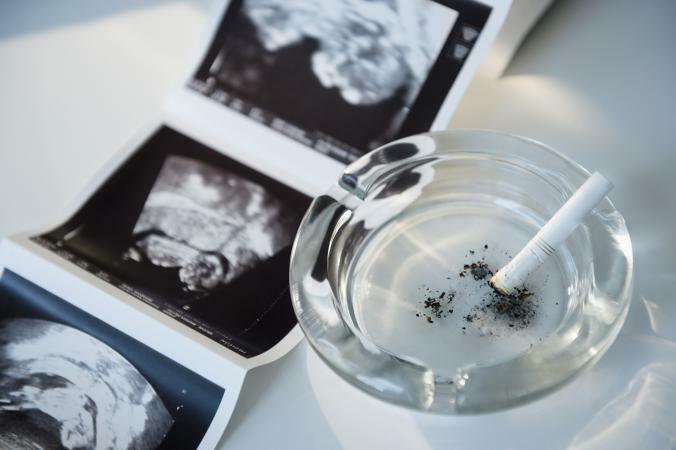 Tobacco and drugs have been linked to low birth weight, premature birth, and other problems, and drugs can also cause birth defects, and increase the risk for stillbirth. Don't drink alcohol at any time during your pregnancy. Alcohol causes birth defects and it is unknown if there is any amount of alcohol that is "safe" during pregnancy. A healthy pregnancy diet plan should include the adequate amounts of protein, whole grains, fruits, and vegetables which are essential for the health of you and your baby. Foods rich in folic acid and a folic acid supplement help decrease the risk of neural tube defects, particularly in early pregnancy. Begin taking a prenatal vitamin. Pre-natal vitamins with iron are often recommended, and you can buy these over the counter or get a prescription from your health care provider. Continue regular exercise, or begin doing some low-impact exercise. This can be as simple as regular walking or swimming. Also consider whom do you want to tell you are pregnant and when to tell them. Whom and When to Tell? Even with planned pregnancies, a fear of miscarriage might stop many women from spreading the news. Although these emotions are normal and understandable, it can be extremely helpful to discuss your pregnancy with someone, such as your husband or partner, a relative, or a close friend. Teens in an unplanned pregnancy situation can talk to a school counselor, clergy member, family friend, or another person you trust to offer advice and help. Telling the father of the child, even if you are no longer in a relationship with that person, is also important. He may want to be a part of the child's life and can also assist in providing financial child support. In cases of abusive relationships, or where drugs or alcohol are involved, talk to a counselor first. Many people agree it might be best to wait until after the end of the first trimester before telling people beyond your partner and select, trusted confidants. In the end, don't feel pushed to announce your pregnancy until you are ready. You can tell each person one-on-one or make a general pregnancy announcement, which can be can be traditional or creative, including cards, photos, videos, or other social media ideas. Even the savviest of women will face a huge change with motherhood looming in the future. Being a mother is a special and rewarding gift, but it does take some planning, preparation, and life changes. After having a positive pregnancy test and scheduling your initial prenatal care, you may want to begin to assess your situations to prepare for the future. With work flex time and telecommuting options, more and more women are continuing to work after having children. It is more possible to finish school and have a career and raise a family in today's society, with many programs in place dedicated to helping women succeed. You'll need to discuss with your spouse, partner, or family what your future goals are so you arrange all the physical and psychological support you might need from them. Discuss your plans to work or stay at home If you plan to stay at home with your partner as well. If you live in a small apartment or house without space for a child, you'll need to consider your future residence. Although babies initially can sleep in a cradle or crib in mom and dad's room, you'll most likely want to try to ensure your child has a room of his or her own. Pregnancy is a great time to take parenting classes, read books and magazines, and talk to other mothers about parenting methods. You'll also want to consider whether you'll be breastfeeding after the baby's born. Breastfeeding is recommended because of its emotional and health benefits and you should be able to pump you milk for storage when you return to work. Women who are uncomfortable with breastfeeding or pumping nd plan to return to work full time might want to bottle feed their baby. American Pregnancy Association - An organization dedicated to promoting wellness in pregnancy. Pregnancy Help Line - A site offering information and resources related to pregnancy. Bethany Pregnancy and Adoption Services - A christian organization offering pregnancy and adoption support. Maintaining your health and well being is essential at all times but especially during pregnancy. Don't hesitate to seek and gather all the help you need to ensure the best outcome for you and your baby during and after pregnancy.